A perfect blend of two highly popular medicinal strains. With a combination of both White Widow and Girl Scout Cookies genes, White Cookies cannabis seeds were always going to be a potent and well received strain. A balanced hybrid, containing 60% Indica and 40% Sativa genetics, expect a fast-flowering plant, that’s easy to grow, responding well to a wide variety of growing methods, both indoors and outside. Totally feminized, every White Cookies cannabis seed is guaranteed to produce a pure female plant. Its Indica influences generate a medium sized, bushy plant, with multiple budding sites, perfect for both Screen-of-Green and Sea-of-Green cultivation methods. Maximize your yields by employing super-cropping techniques, as well as bending, topping or staking to promote the best growth possible during the vegetative stage. Flowering requires a decrease in daylight hours, to a maximum of twelve hours per day. Once started, expect between 8-9 weeks for the plants to completely ripen. With short Summer’s and cold Winters, outdoor growers will need to plan ahead. This sometimes means that growers in the more northern parts of Canada complete the plants flowering cycle indoors. Indoors growers, with good lighting and plenty of fresh air, can expect to find White Cookies cannabis seeds easy to grow and forgiving of many common mistakes. With better control over the growing conditions, buds are large, dense and very ‘frosted’ as you would expect from a ‘White’ strain. Yields are good, returning approximately 400 grams per square meter of the highest quality buds when grown indoors with good techniques and conditions. Outdoor growers should expect a maximum of 200 grams per plant, given the short Summer, and fast onset of Winter, that occurs in Canada. Girl Scout Cookies is well known for its intense flavor, White Widow for its frosted appearance and medical applications. Combining both to form White Cookies cannabis seeds, produced a potent, aromatic smoke that delivers an intense, euphoric high, as well as being a versatile and useful form of medicinal cannabis. THC levels of 19% are high enough for all recreational users. While CBD levels of 0.075 can have an uplifting effect, reducing stress, anxiety and depression, as well as chronic pain, and many other medical conditions. Produced and dispatched directly by Crop King, one of Canada’s leading suppliers of high quality cannabis seeds, you can buy these feminized White Cookies cannabis seeds in complete packs of 5, 10 and 25 seeds, with all the help and support you may need, from purchase through to harvest. Enjoy a variety of ways to pay, as well as a first-class customer support, always available to answer any questions or concerns you may have. Click below to learn more and buy White Cookies cannabis seeds. Canada 2-7 business days, USA within 14 days. If 80% of your marijuana seeds do not germinate, then they will be replaced. Buy White Cookies Feminized Seeds today and receive fast discreet shipping to Canada and all US states. Copyright © 2019 Cannabis Seeds Canada. All Rights Reserved. 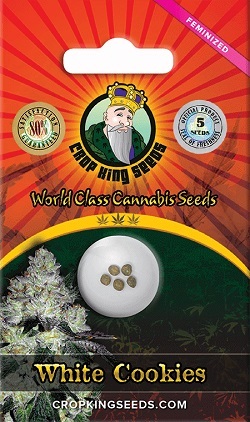 Cannabis Seeds Canada.